I have been thinking about summer breakfasts lately. How could I not with the sun blazing and the mercury rising as it is nowadays? Despite the heat (and my sunburn…when will I ever learn??) and my love/hate relationship with the mornings, the season’s buoyant personality seems to be cheering me on. And I’m determined to have breakfasts that are just as bright and sunny. But that will have to wait until I’m done with this. This is not the most summery of breakfasts but I have been seeing this all over and, as a lover of both breakfast and oatmeal, I had to try it and couldn’t wait. A good friend I met though blogging alerted me to this intriguing version and it’s been on my mind ever since. So despite the sun streaming its rays of Pollyanna through my window and the optimistic patch of blue sky I see from my window, I set about creating my first ever bowl of savory oatmeal. The idea isn’t as novel as one would think. In some cultures oatmeal is savory, enjoyed with a pat of butter and some salt. We, of all people, shouldn’t raise an eyebrow. Over here, we have chocolate rice pudding (champorado) with dried salted fish – now that’s a combination you don’t see every day. On the whole though, oatmeal has always leaned more decidedly towards sweet preparations. So for me the idea of it was new and luscious and very enticing. This is hardly a recipe, and really, I suggest you go with your favorite basic recipe for oatmeal (I usually go with 1/2 cup of oats and 1 1/2 cup of water — this will make me two servings). I used steel cut oats here because I felt the texture would lend itself well to savory preparation (although I am sure rolled oats would be good as well). What is key here is that you use the best possible ingredients you can find. I know, when is that ever not key right? Well, in this case more than others as there are so few ingredients so each is a major player. Now place one serving of hot oatmeal in your favorite cuddle bowl. Top with a couple of swirls of olive oil, a sprinkling of sea salt flakes, a grinding of black pepper, and generous shavings of parmesan cheese. Now tuck in and prepare to be converted. I suggest keeping the condiments near because you may want to adjust as you work through you bowl. I definitely like adding more parmesan at some point. This is really all that they say it is. It is silky in a way regular oatmeal hardly is. It feels decadent when it is in fact so simple. And the sudden bits of saltiness cutting through the creamy oatmeal feels at once pleasantly confusing and, as Golidilock said, just right. I’ll be making this again. Yes, even if it’s summer. I’m still thinking of that fried egg…and maybe some browned butter. Don’t worry. I won’t be spending the whole summer churning out oatmeal on the stovetop. We just got a box of our favorite mangoes so those summer breakfasts will be making their appearance here soon! Well, I will keep this suggestion as that, a suggestion, I have never tried my oatmeal on a savory way. Now, mangoes. Oh Dios. I love them. Do you know what´s funny, in my country the best variety is the Mango Manila 🙂 . Oh, and we also have champurrado, but is totally sweet, is made with masa harina (corn flour) and chocolate. The texture is very similar to congee. I have never tried oatmeal on a savory way, but it looks like a good recipe to try. @Heidi, what country are you from? We also have Mango Manila in my country and it is delicious!!! I actually do not enjoy the mango here in america as much cuz i am so used to the mango back at home! Back to the Savory Oatmeal, oatmeal is a great way to start your day. There are so many benefits to oatmeal, btw try to add a spoon of honey to it each morning and you will feel more energized! I am amased how could you hold back a fried egg :):) We although deep-root with oatmeal sweeten with condense milk (and egg :):) your version is totally shine and divine!!! Jo, you are great! savory oatmeal…now that sounded a bit strange but intrigued me all the more. I think I like a sweet and savory oatmeal kind of like champorado with tuyo / longganisa / tapa 🙂 any suggestions? Thta savory way of preparing oatmeal is fabulous! I love the idea. This is like a childhood flashback – only what I remember is a mixture of oatmeal and pearl barley cooked like congee in chicken broth! Yay, you finally did it! Doesn't it just open your eyes to a whole new way of enjoying oatmeal, and make you excited to try it with other ingredients?! 🙂 After I first had it, I had savory oatmeal for dinner three times in one week, so that I could experiment. So far, my favorite was with butter, a fried egg, and parmesan. REALLY decadent-tasting, with the runny yolk and butter giving it the most indulgent texture! What a wonderful idea. I tried it this morning. I also wrote a post about it and linked back to you. Not often that happens for me that I am compelled to do a post on something I find right away, but this deserves it. Hi Pam! Now that I’ve tried this I have to say that cheesy oats are GOOD! Hi Brittany! It truly is versatile…both in its sweet and savory preparations! Hi Hector! I am a very big fan of oatmeal and I love that we can have it in so many ways. With honey is definitely lovely 🙂 When I travel I also miss our mangoes! Hi Didi! Sweet and savory at the same time? I haven’t tried that yet but the first thing that comes to mind would be bacon and honey! Hmmm…that may just be my breakfast tomorrow! Hi Rosa! Try it, it’s really awesome! Hi 3748 Miles! OK…I really need to try it with that egg already! 🙂 Oatmeal cakes sound like something I would really like for breakfast too! Hi Midge! OMG…congee = the original savory porridge! Hi Wendy! My goodness, that was fast! You made it before I could even answer your comment 🙂 Glad you loved it too! I really, really like this idea! Thanks for sharing. I'm going to try it with some truffle oil. This sounds really great! Olive oil, pepper and cheese on my Oatmeal!! Love the idea. I am a HUGE HUGE fan of poached eggs over savory oatmeal. I'm trying to convert my friends and family haha. I make mine with margarine, pepper, nutritional yeast, and chili powder and top it all with a few dashes of Frank's. I could eat this every morning! This looks great, and a different treatment than I've seen. A few years ago a friend showed me this savory oatmeal: she sauteed spring onions, almonds, and kale in olive oil then added rolled whole oats. After the oats were coated in the oil, she added a little water and a good splash of soy sauce, but not so much liquid as you would normally use for porridge. It only took a minute or two for the oats to absorb the liquid, then voila! I will definitely try this parmesan version, thanks! Hi Ellen! I think truffle oil would be fabulous on this…in fact I may just try that really soon! Hi Sanjeeta! I really loved it…give it a try! Hi Jules! I must try it with some poached eggs soon! Hi Stephfret! Wow, that version of your friend’s sounds delicious too! Hmmm, another version to add to my to-try list! Hi Redmenace! Yes, exactly sort of like grits…and I’ll definitely be adding the egg next time! Hi Didi! I’ll be trying that myself too! So brilliant, and so obvious, but never occurred to me before. I imagine it would also be great with chilis, fresh cilantro, or perhaps olive oil and lemon. Maybe a sharp cheddar and chives. Now that you've got me thinking, I may just play around with it until I've mastered oatmeal risotto! Thank you for the fun idea. I stumbled upon your blog, and I am glad I did! I love breakfast food! Oh yes, savory oatmeal is simply the best. In fact, these days, I have savory oatmeal more than sweet oatmeal.For those who have not tried it, you really have to try it! My all time favourite combination will be old fashioned oats + chicken stock + pepper, topped with toasted sunflower seeds, dippy egg, and scallions. I'm really lazy, so I cook mine in the microwave. I have yet to try it with steel cut oats, but I would imagine it to be equally wonderful- if not, better! Hmmmm interesting idea! 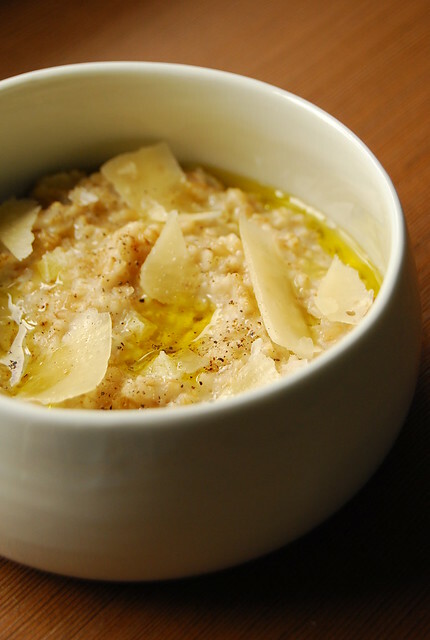 I love olive oil and shaved parmesan, never tried them with oatmeal. Hi Kayla! Thanks for stopping by and leaving a comment 🙂 Mmmm…that sounds delicious!